Hot on the heels of the HTC 10, another flagship device has joined the packed Android smartphone market, but this one has something that sets it apart from the rest: a 10-core mobile chip, the MediaTek Helio X25. Speaking of design, you’ll probably notice that the device bears a remarkable resemblance to the iPhone. The similarities to Apple’s device don’t end with the looks; the Meizu Pro 6 has a feature called 3D Press, which works in a similar way to the iPhone’s 3D Touch. Other specs include a 21-megapixel f/2.2 rear camera that comes with laser autofocus and a unique flash ring consisting of 10 LEDs, as well as a 5-megapixel f/2.0 selfie cam. It can also accept two nano-SIM cards and has a Cirrus Logic CS43L36 audio chip which, according to Meizu, provides an excellent audio experience. There are a couple of downsides to the Meizu Pro 6; it doesn’t support NFC, and at 2560mAh, the battery isn’t as beefy as some of the competitors. However, Meizu says that the architecture of the deca-core chip will be able to extend the phone's life based on usage behavior, and the rapid charging feature will take a battery from empty to 100 percent in under an hour. "The brand-new Helio X25 processor adopts a revolutionary 10-core 3-cluster architecture. The Cortex-A72 CPU and the Mali-T880 GPU complement each other perfectly, resulting in an Antutu score of 101757 points," says Meizu. "With eMMC 5.1 flash memory and ultra-large 4GB RAM, Meizu PRO 6 can easily handle all situations. Meizu PRO 6 is also integrated with the kernel-level power-saving algorithm. It can intelligently switch between three clusters to balance endurance and performance." The best aspect of this smartphone could be its price; while there’s no word yet on global availability, it’s available to pre-order in China at 2499 yuan ($385) for the 32GB version and 2799 yuan ($432) for the 64GB option. 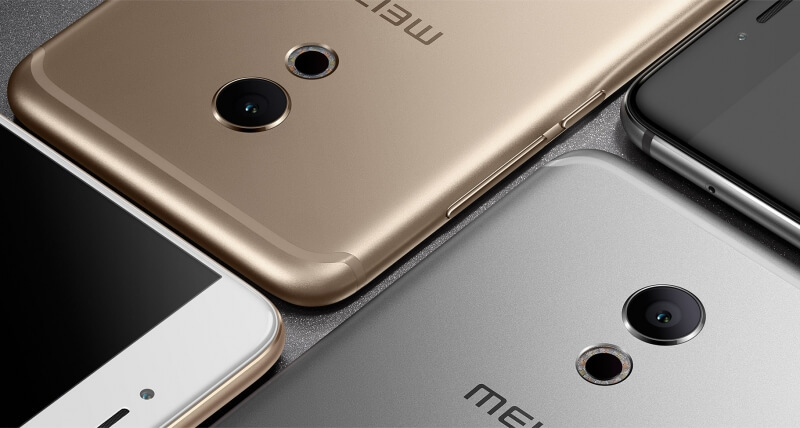 The Meizu Pro 6 comes in a choice of black, silver, or gold colors.